I thought Sanderson couldn’t possibly top what he wrote in part one. I thought that was it, his piece d’resistance, his absolute best. I was wrong. I finished this book less than a week after I started it. I read it in the mornings. I read it after work. I read it during work (sorry boss), and I read it late into the night. For those who know me, that’s incredibly not like me, at least not anymore. When I was younger, sure. But now I’m older, with adult responsibilities and adult activities. But this book took me back and turned me into that child once again, reading those last few pages with trembling hands and struggling to keep my composure as goosebumps crept up my neck and arms. 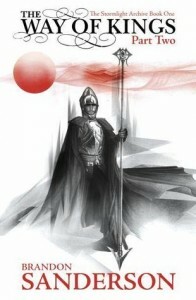 The Way of Kings is true epic fantasy. It’s remarkable, memorable, incredible, astonishing, tear-jerking. It’s everything I want my writing to be, and more. It’s to be pointed to in the future as a classic example of fantasy. There will be university courses with this book as required reading. It had the best damn example of a Big Hero Moment that I’ve ever had the pleasure of reading, and this was only the first book in the series. Seriously. How the hell is he going to top it? I have no idea, but I’m looking forward to finding out. Gushing aside, I cannot honestly find a way to fault this book. I purposely held off from reviewing it until a few days after I finished, so the warm and fuzzies I got from it had worn off. But it’s no use. I’m hopelessly, madly in love with this series, and I’ve driven all my friends mad with my relentless and oftentimes violent praise. I dread the day when it all finally comes to an end. Thankfully, that won’t be for a while yet, with only the third book in the series due some time this year. My only hope is that it doesn’t turn into a George R R Martin-esque book drought, with waiting times measured in decades as opposed to mere years between books. And speaking of George R R Martin, and of Game of Thrones, Way of Kings is everything Game of Thrones would have been, had Martin not been raised to believe that hope is the shelter of the foolish and the damned. I don’t know about you, but reading how your favourite characters die in horrible, tortured ways just gets tiring after a point, and thankfully Sanderson has managed to avoid butchering his protagonists while at the same time pitting them in authentic, dangerous situations. It’s a very fine line to walk, but he was walked it masterfully. I’ve nothing more to say about this book. Read it. Read it now. You won’t be disappointed.